What is a Pig Share? In our pig share customers, or “share holders”, commit to purchasing a whole or half pig in the spring by making a deposit. We can then put the deposit toward the cost of raising the pig. In the fall the remaining cost is paid when the pig is butchered and delivered. Share holders receive a variety of cuts including hams, chops, bacon, sausage and more and have the opportunity to choose your own cuts. This model strengthens connections between the community and our farm. We benefit from financial support early in the season, while you benefit from connecting with a local farmer and receiving a year’s supply of delicious, high quality pork. This relationship allows share holders to learn more about the farm, how the animals are raised and where their food comes from. Visiting the pigs is also encouraged (please arrange with us first). A deposit of $200 per side (half) is given to us once your participation in the program has been confirmed in the spring. We then spend the summer raising the pigs and in the fall, once they are taken to the butcher, we charge each member $5.90lb on the final hanging weight, plus the processing and butchering fee. Depending on your choice of cuts, generally a half pig costs around $100 to process and butcher. The $5.90lb is an average price that covers the cost of feeding and raising the pigs as well as transportation costs. (FYI some cuts of local, organic bacon and chops can sell for up to $16lb). We estimate the hanging weight of our pigs to be between 80-120lbs per side. Rootdown Organic Farm have raised Tamworth pigs since 2010. In 2014 we were excited to be raising a cross breed of Berkshire with a wee bit of Tamworth. Berkshire is a chef’s favourite breed, known for its exceptional flavour. They were fabulous pigs, so we will be raising the same breed again in 2015. 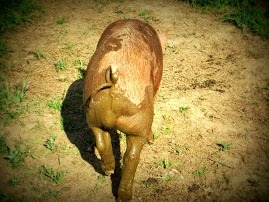 Our pigs are raised naturally with no antibiotics, on our organic pasture. We feed them certified organic grain mixed with local oats and barley from our neighbours at Pemberton Meadows Natural Beef. 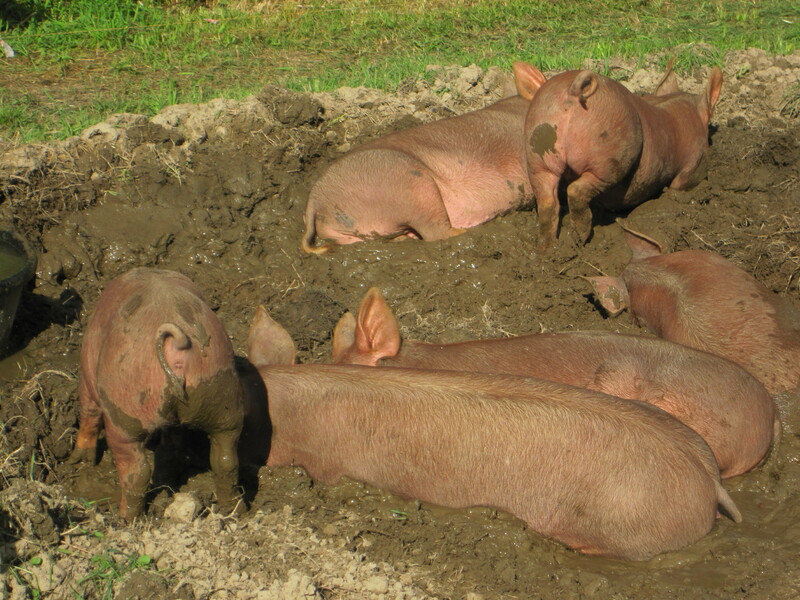 Every four weeks the pigs are rotated to fresh pasture where they have ample space to root around. If you are interested, please email info@rootdownfarm.net to be placed on our waiting list. Yes, the pig share is very popular and we currently have a waiting list. We do give first priority to our previous years members and then will move down the list. You will be contacted sometime in May. Please also note, we are only accepting residents of Whistler and Pemberton in an effort to keep it local. We believe that it is important to incorporated animals into our farm. A sustainable farm is one that mimics and works with the natural ecosystem, and in any ecosystem there are both plants and animals. The animals on our farm, both pigs and chickens, play an important role in managing our farm “agro-ecosystem”. In addition to providing food, their manure helps cycle nutrients on the farm so we do not have to buy so much manure from outside. They also help prepare old fields by rooting around and scratching up weeds. We rotate our pigs and chickens through future vegetable fields. The animals spread their manure and control pests and weeds, while enjoying the fresh pasture. Our animals are healthy because they are out in fresh air with lots of space, where they can eat grass and bugs and are able to express their natural behaviour. We love our animals as they are a joy to be around and because they are an integral part of our sustainable farm system.